Otto Rung: Den Hvide Yacht (1906), 244 pages. PROBABLY THE EARLIEST INSTANCE OF THE USE OF MOTOR RACING SCENES IN FICTITIOUS LITERATURE. Malcolm Campbell: For fuldt Drøn (1935), 135 pages. TRANSLATED FROM THE ENGLISH - ORIGINAL TITLE UNKNOWN. Hans Stuck: Fuld Fart (1935), 150 pages. TRANSLATED FROM THE GERMAN - ORIGINAL TITLE UNKNOWN. Douglas Rutherford: Grand Prix Mordet (1956), 190 pages. TRANSLATED FROM THE ENGLISH, ORIGINAL TITLE: GRAND PRIX MURDER. Chr. 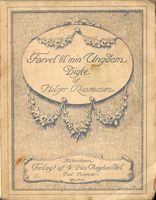 Ramsgaard: Gøgler-Drengen (1957), 92 pages. Ian Fleming: tju tju bang bang - DEN MAGISKE BIL (1966), 141 pages. TRANSLATED FROM THE ENGLISH, ORIGINAL TITLE: CHITTY CHITTY BANG BANG. CHILDREN'S BOOK BY THE AUTHOR OF THE JAMES BOND BOOKS. THE BOOK IS DEDICATED TO THE FAMOUS RACE CAR SUCCESSFULLY DRIVEN AT BROOKLANDS IN THE EARLY 1920S BY COUNT ZBOROWSKI. Alistair MacLean: På Vej Mod Døden (1973), 203 pages. TRANSLATED FROM THE ENGLISH, ORIGINAL TITLE: THE WAY TO DUSTY DEATH. Bent Rasmussen: De Hvide Hænder (1976), 125 pages. THE BOOK WHICH THE DANISH MOTORSPORT-RELATED FILM "MIG OG CHARLY" IS BASED ON. HOWEVER, THE FILM SCENES AT JYLLANDS-RINGEN ARE NOT IN THE BOOK, THEY WERE ONLY IN THE SCREENPLAY. Peter Tanous: Amelia Earharts Sidste Flyvning (1978), 150 pages. TRANSLATED FROM THE ENGLISH - ORIGINAL TITLE: THE EARHART MISSION. SEMI-AUTHENTIC. NO DUST-JACKET. R. A. Montgomery, Jr.: Verdens Hårdeste Rally (1985), 116 pages. TRANSLATED FROM THE ENGLISH - ORIGINAL TITLE: THE RACE FOREVER. Peder Hove: Det Store Spring (1989), 144 pages. ABOUT THE AVIATOR JOHN TRANUM, SEE ABOVE. SEMI-AUTHENTIC. Peder Hove: Mille (1992), 165 pages. ABOUT THE DANISH AVIATRIX EMILIE SANNOM, SEMI-AUTHENTIC. Jane Mendelsohn: Jeg Var Amelia Earhart (1996), 179 pages. TRANSLATED FROM THE ENGLISH - ORIGINAL TITLE: I WAS AMELIA EARHART. SEMI-AUTHENTIC. John Jakes: Den Amerikanske Drøm (1998), 2 vol.s, 281 and 254 pages, respectively. TRANSLATED FROM THE ENGLISH - ORIGINAL TITLE: AMERICAN DREAMS. Alessandro Baricco: Denne Historie (2008), 269 pages. TRANSLATED FROM THE ITALIAN - ORIGINAL TITLE: QUESTA STORIA. Manning Lee Stokes: Grand Prix (), pages. TRANSLATED FROM THE ENGLISH - ORIGINAL TITLE: .